Starting with Xcode 10 XCLOC is the new format for project localization. Xcode Localization Catalog is designed to provide additional contextual information for translators. It also provides support for a wide range of Localization Resources like .strings (.stringsdict), images, markdown, and others. It is built on top of XLIFF format and still uses it for storing localized strings. Localization Resources are store in Localized Contents directory inside the Catalog. Lokalise offers support only for text resources exported as XLIFF files. You can generate XCLOC file by selecting your project in Xcode and running Editor -> Export for localization... action. In order to import newly exported localization, you need to open your Localized Contents directory inside your Localization Catalog (XCLOC) and selected the generated XLIFF file. 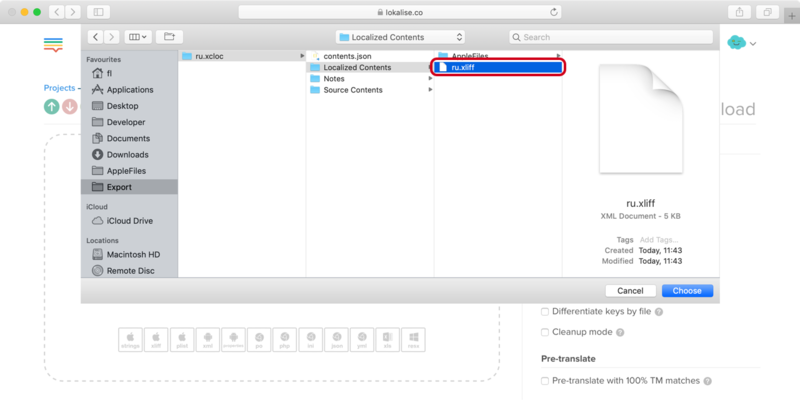 When exporting translation from Lokalise select Apple XLIFF (.xliff) format. You can import generated XLIFF files info Xcode project the same way you would import a Localization Catalog. Apple XLIFF (.xliff) support details. New Localization Workflows in Xcode 10 from WWDC 2018.